Psoriasis is a long lasting disease characterized by patches of abnormal skin. These skin patches are typically red, itchy, and scaly. It can occur on any part of the body, however the most commonly affected areas are the knees, scalp, elbows, knuckles, lower back and sacral areas. It isn’t contagious, though it looks like it might be. Normally, skin cells mature and die about once a month. But, in case of psoriasis, they tend to mature and die in less than a week, thus causing a buildup of dead skin cells. 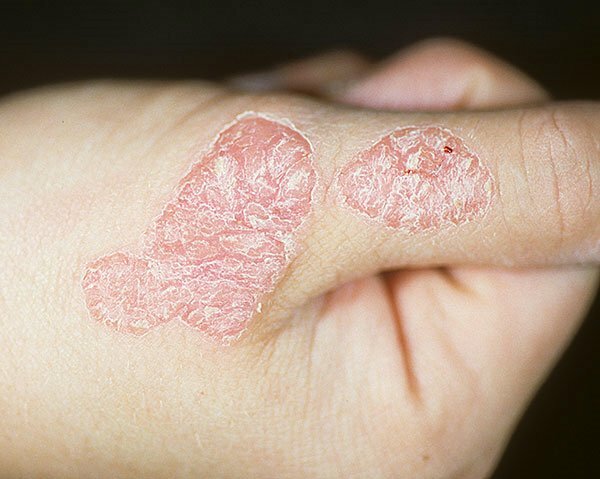 No one really knows what psoriasis is — an allergy? An infection? And even with all the advanced medical knowledge in the world today, the causes of the condition remain a mystery. There is no cure for psoriasis. However, there are many natural home remedies for psoriasis which can temporarily relieve the symptoms, moisturize and soften plaques, and help to heal damaged skin. Also, do consult your doctor for proper diagnosis and treatment. Here are the top 9 home remedies for psoriasis. For centuries, many people have used tea tree oil to treat skin problems and infections, including the treatment of psoriasis. The potent tea tree oil is typically mixed with carrier oils like olive oil or sweet almond oil before it is applied on psoriasis lesions. You can mix a few drops of organic tea tree oil with two to three tablespoons of extra virgin olive oil. And then apply this oil blend on the psoriasis lesions. Allow the oil blend to remain on the skin lesions for fifteen to twenty minutes. Wash off the excess oil with luke-warm water. Some patients have found that tea tree oil works best on scalp psoriasis. A minimum of 5% concentration of tea tree oil is effective enough for your daily dose of regimen. Add ten drops of tea tree oil in your shampoo (if you have severe scalp psoriasis) every time you take a shower. Note: use tea tree oil externally only. HealthDoyen recommend this 100% Pure Tea Tree Oil available through Amazon. Apple cider vinegar (ACV) is widely recognized as one of the most potent and beneficial natural remedies on the planet. It helps restore the natural pH balance of the skin and helps prevent infections. According to the Psoriasis Foundation, some folks with psoriasis have reported success in using it to treat their condition. In order to prevent burning of sensitive skin, it is recommended to dilute vinegar at least 1 : 1 with water before use. Apply the solution directly on the psoriatic skin lesions. Allow the diluted apple cider vinegar solution to remain on the skin lesions for ten to fifteen minutes. Alternatively, mix one teaspoon of organic apple cider vinegar in a glass of water and drink it twice daily, especially during flare-ups. For highest quality and maximum health benefits, HealthDoyen recommend Bragg Organic Apple Cider Vinegar, available from Amazon. Dry skin can crack, bleed, and become infected, so it’s important to keep your skin moisturized. For the psoriasis you need to use a thick based moisturizer which can help to remove plaques and speed healing. Moreover, use a humidifier to keep the air in your home or office moist. It can prevent dry skin before it starts. You can easily find a Humidifier on Amazon. There have been numerous studies linking the omega-3 fatty acids in fish oil to heal your psoriasis outbreaks more quickly. Because psoriasis is an autoimmune condition with its root in inflammation, eating fish with lots of omega-3 fatty acids (like ELA, ALA, and DHA) that have been clinically shown to reduce inflammation can improve your condition. Cold water fish like salmon, mackerel, sardines, and tuna are excellent sources of omega-3 fatty acids. Note: Don’t take fish oil if you’re on blood thinners — it can raise your risk for bleeding. Fish oil supplements in capsules can also be consumed regularly. You may order them online like these Now Foods Ultra Omega 3 Fish Oil Softgels available through Amazon. Aloe vera is one of the most popular and widely used natural remedies for skin ailments. In a recent study, aloe vera was proven to be more effective than topical steroids in relieving psoriasis. In fact, nearly eighty three percent of people suffering from psoriasis showed remarkable improvement after applying aloe vera gel thrice a day for a month. If you’re ready to experience the healing power of aloe, check out this highly recommended aloe-based Organic Psoriasis Moisturizing Cream by MetaDerm – available from Amazon. Some people with psoriasis have found relief with turmeric as a natural psoriasis treatment. Curcumin – a natural phenol found in Turmeric – is fairly well-known for its anti-inflammatory properties, making it an effective natural remedy for psoriasis. You can make a thick paste by combine one heaped teaspoon of organic turmeric powder with three to four tablespoons of filtered water. Apply it on the affected area, cover with a gauze and leave it on overnight. The next morning, remove the gauze and rinse your skin with lukewarm water. Baking soda isn’t just for cooking and cleaning. Medical research has shown that baking soda can actually reduce the feeling of itchiness due to psoriasis. Take 1 teaspoon of baking soda and 4 teaspoons of water. Mix them together and apply it to the affected area. Apply this with a sterilized cotton or cloth, to prevent bacteria. Leave it on till it dries and fall off. Epsom salts are an effective home remedy for psoriasis. Soaking in a bath with Epsom salts can reduce swelling and irritation of the skin. Simply add a plastic measuring cup of Epsom salts into the bath water. Immerse yourself in this warm, relaxing bath for fifteen to twenty minutes. Blot your skin with a towel once you get out of the bath. Then apply a moisturizing oil or other heavy, thick moisturizer to your still-moist skin. You’ve probably heard of this one before – Oatmeal bath. Oatmeal bath is another effective way to relieve the itching, redness, and inflammation of psoriasis. Oatmeal is loaded with vitamins and minerals (like selenium, manganese, and iron) which are excellent for healing damaged skin. It also softens and soothes the skin, as well as calms the nerves. For even more relief, add finely ground oatmeal, Epsom salt, or Dead Sea salt to the water and soak for 15 minutes. Another option is to wrap two handfuls of oats in a muslin cloth, place it in the bathtub and run hot water over it. Next, add some cold water to bring the bath water to a comfortable temperature and squeeze the oat bag, then allow your body to soak into it for at least 15-20 minutes. When you get out of the bath, rinse with lukewarm water, pat dry your skin and generously apply a good moisturizer. Check out this 100% Natural Colloidal Oatmeal by Aveeno, available through Amazon.